Goodness! There are all sorts of crafty goings on this weekend in Vancouver, aren’t there? 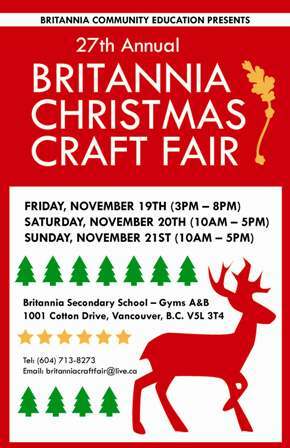 I will be one of the lovely vendors at the Britannia Christmas Craft Fair kicking off on Friday at Britannia Secondary School, which is just off Commercial Drive. I did this show last year & really enjoyed it. It wasn’t quite as hipster-oriented as the shows I usually do, which was a nice change of scenery. There was a good mix of younger, more modern crafters & artists plus the traditional hobbyist crafters. At first I was a little worried when I noticed the lady beside me selling crocheted pot scrubbers, but she was incredibly nice & to my surprise, they sold like hotcakes! It’s funny…I’m so insulated as part of the younger pro-Etsy, pro-Handmade Nation community that I sometimes forget what a traditional “craft fair” looks like in a church basement or high school gym. The craft markets that I attend are more likely to sell mustaches on sticks or felt ninjas rather than clocks made out of tree trunk slices or tacky hand-painted bird houses. The pot scrubbers reminded me of that old school kind of show, but if they were made in cool colors & marketed as an eco-friendly alternative to disposable sponges? They’d fit right in. I rarely get a chance to walk around these shows since I have to leave my table vacant, but a couple of tiny highlights from last year were some very sweet high school girls selling handmade soaps in cute shapes (I bought the fortune cookie ones that came in a little white take-out container – awesome stocking stuffer!) & a lady selling pet treats (all natural, no preservatives & yummy stuff like dehydrated bison jerky that my puppies wolfed down). After I set up on Friday I’ll be sure to snap some photos to update on the vendors for this year. Friday – 3:00 p.m. to 8:00 p.m.